← It’s been so long ……..
My PR company – Splash have just been voted the best PR agency in South Africa at Sunday nights Prism awards. Well done to Kerry, Doug and the team for promoting Table Mountain as one of the new seven wonders of the world. Their campaign was fraught with tension, stress and emotional upheaval but the hard work paid off and South Africa will no doubt benefit from the PR for years to come. I have certainly reaped the benefits of their hard work in the past and look forward to working with them in the future. More exciting news is that I have been able to secure a regular supply of pasture reared beef from Angus Mckintosh of the Spier biodynamic farm. He raises cattle, sheep and chickens along the same lines as Joel Saladin at Polyface Farm in the good old US of A. Take it from me, this beef tastes different. It is grass fed (cattle are ruminants you know) and has a beautiful colour and texture. 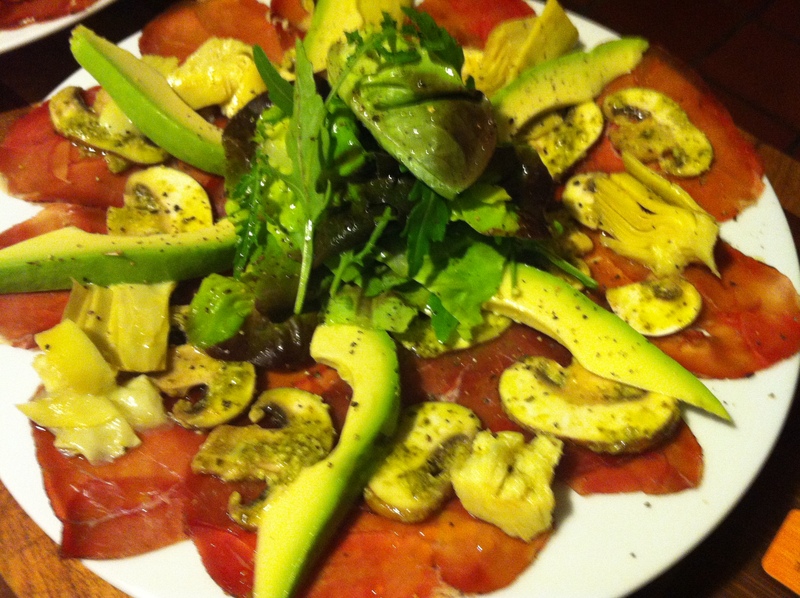 The Commander is on a protein drive currently and what better excuse for a bresaola, artichoke, mushroom, avo and rocket salad as a light meal. The recipe below is really quick and simple and could easily be served as a starter too, just halve the amounts. Mix the pesto and the lime juice and olive oil together to make a dressing. Arrange the mushrooms on a plate and paint with the pesto dressing. 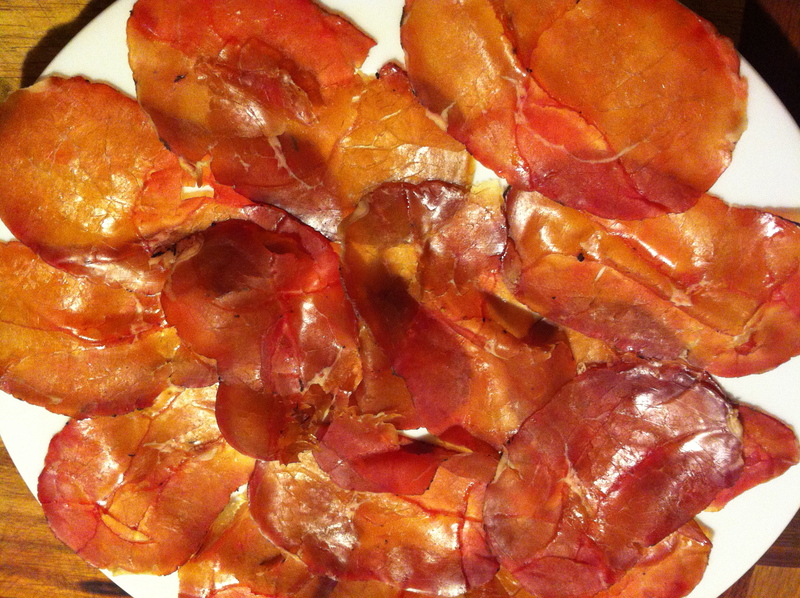 Arrange the bresaola on a large dinner plate in a single layer. top with slices of marinated mushroom, artichoke quarters, slices of avo and a handful of baby leaves in the middle. Pour over any remaining dressing and add a good grinding of black pepper. This entry was posted in Welcome and tagged food. Bookmark the permalink.